Below is a list of rules and guidelines for care and maintenance of your finished and reglazed surfaces. It is important not to use the surface for the specified number of days or hours which we will indicate at the completion of the job (as each surface and job will require a different cure time). Surface dust is normal and will disappear with normal cleaning and usage within 3-4 weeks. Never smudge it or wipe it with your finger. Call us if it has been longer than 1 month and your are still seeing surface dust. Each time you use your tub, it us good practice to wipe it down with a towel. It doesn’t have to be dry, but it removes standing water. Maintaining caulking around your tub is also good practice to ensure longer lasting results. 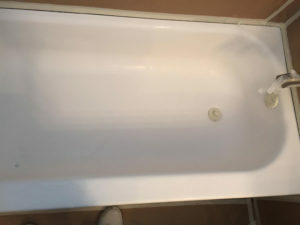 You should also consider waxing your tub once every 4-5 months with a urethane polish such as turtle Wax. We also recommend you polish your bathtub 5 days after it has been reglazed. There is really no need to use abrasive cleaners on refinished bathtubs, as the surfaces are non-porous. Most household liquid detergent/cleaning agents will give excellent results.